Muir Beach before sunset from my mother-daughter vacation to California last month. Ta-Nahisi Coates won a MacArthur "Genius Grant" last year for his journalism and memoirs on race and politics. Between the World and Me describes what it's like to live in a body that is a black in the USA. Coates recounts the history of slavery, Jim Crow laws, his own perilous childhood in West Baltimore and more recent events like Eric Garner's death to explain systemic racism in America. I read similar books for Literature of Social Reflection back in college, but this 2015 National Book Award winner speaks to our current crisis and makes sense of the #BlackLivesMatter movement. Coates's personal approach to the subject teaches empathy and compassion. Between the World and Me wasn't an easy book to read because it flags the failings in our nation, specifically in our system of justice. Although only 151 pages long, this eloquent memoir took me several days to finish and longer to process. 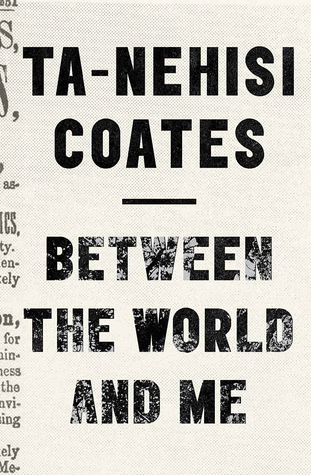 Coates made me live inside a black man's skin and see the world through his eyes. He tells true stories of well-educated and compassionate men who play by the rules and are still crushed. There are incidents of police brutality (officers both black and white) but also the unintentional racism of people who identify as white and benefit from the system oppression. So much needs to change in the way we think, speak and act. Coates does at least leave room for hope. "I remember being amazed that death could so easily rise up from nothing of a boyish afternoon, billow up like fog." 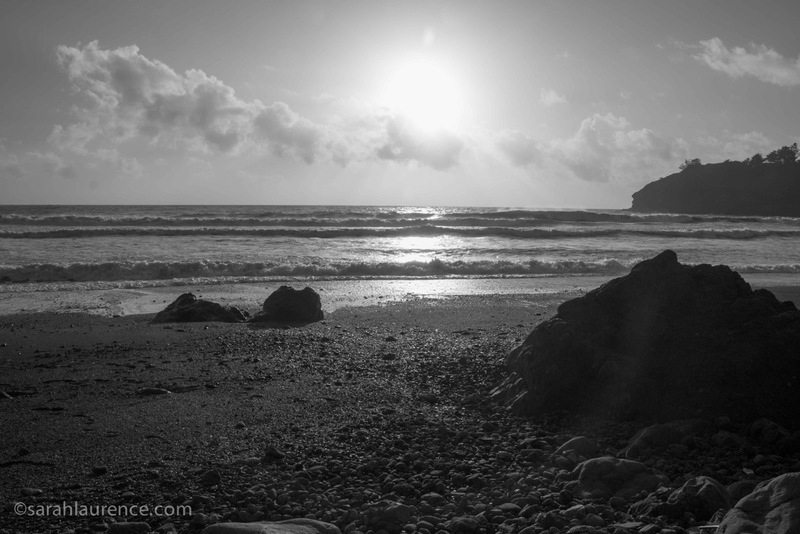 "'Good intention' is a hall pass through history, a sleeping pill that ensures the Dream." "I felt that I had missed part of the experience because of my eyes, because my eyes were made in Baltimore, because my eyes were blindfolded by fear." Between the World and Me was the most meaningful book I read last year, and I would recommend it to everyone, especially to Americans. Since the book was written as a letter to his 15-year-old son, it would crossover well to a teen audience, although it was marketed as adult nonfiction. My mother read it in two days and was deeply moved by the narrative as well. My husband and son are reading it now. "This is required reading," says Toni Morrison in her blurb. Add it to the top of your list. Reviewer's Disclosure: I bought this hardcover book without compensation at Longfellow Books and bought two more copies at Gulf of Maine Books as Hanukkah and Christmas gifts for my son and for my writing crit partner, who loved it too. She read it on Martin Luther King Day. it is shocking and awakening. I do mean to read this one once I can get it at the library. With it winning so many awards, that may take a while. Thanks. I need to read this one too. Sarah, thank you so much for bringing this book to my attention! I agree with Toni Morrison. Having grown up in a place that doesn't seem to see or understand its own racism, I think this should be required reading . . . especially for educators, law enforcement and politicians! What a great choice for Black History Month. I've seen Coates interviewed on TV and I do want to read this book, however difficult the subject matter may be. Thanks for the review. This does sound like required reading--thanks for calling this book to my attention and for a lovely review. The excerpts I have read so far are very, very good. The book not only poses questions but also makes its readers uncomfortable, which, in a perverse way, it is what the author wants to do. And, in my opinion, what needs to be addressed. I don't think it's US-specific, but applicable to many other societies, whether openly racist or not. Thanks for your review. What beautiful stylish passages you included here. I would definitely enjoy reading. Really good review, Sarah. 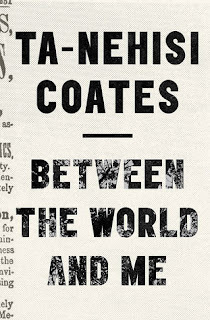 Striking: "Coates made me live inside a black man's skin and see the world through his eyes." I look forward to reading this book as it is on my list of BTBR. I found the timing of its arrival to be most poignant for our world today. I have a feeling I will hope that everyone would read it. Thank you for reviewing this book. One of my goals this year is to read more non-fiction. This sounds like an excellent first choice. I understand Ray's worries about his grandchildren. I'm raising a Korean daughter in a very white environment. Thanks again! I bought this for The Man for Christmas, and neither of us has gotten to it yet. Guess we'd better get a move on. As Morrison says, it is required reading. Thanks for prodding me, Sarah! Racism is a complicated issue because people are complicated, and it's not always one-sided as many people would like to believe. It would be nice if we lived in a color-blind society, but sadly that may never happen. Divisive people tend to get the most attention in the news and in social media, and they feed and grow more powerful on social tensions and chaotic situations. Many people have built their reputations and careers (academic, political, business, as well as literary) on racial tension. It won't be easy to dismantle racism because someone will always be looking to make a career and a buck on the backs of ordinary people who are trying to get along with each other at work, at school, and anywhere else they get together in their communities. Most people have lost the ability and/or the will to be critical thinkers. It's easier to swallow what some iconic figure on the news or in popular culture tells us rather than investigating the validity or integrity of what they say or write. "Go with the flow" or "fly with the flock" or risk being ignored or despised. That being said, I look forward to reading this book because of your excellent review, Sarah, and also because I'm always interested in learning about and from other perspectives.